We Grew Up On This Casserole And I Bet You Did Too! It might be a Midwest thing, but tuna noodle casserole was a staple growing up — probably making an appearance weekly on the dinner table. Creamy soup, tuna, and noodles manage to make for a perfectly comforting combo, with some people opting to added peas for a bit of color and flavor. And then, there’s the best part: the toppings. Our household was strictly about saltine crackers crumbled on the top, but tuna casseroles come sprinkled with everything from fried onions to potato chips to bread crumbs. Whatever you decide, the lightly browned and crispy finished product will add the perfect crunch and texture to the casserole. 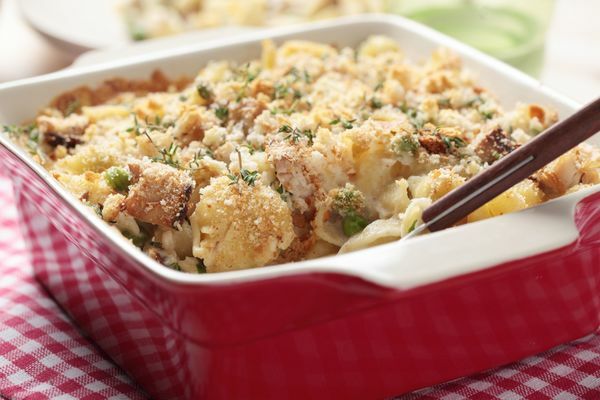 To fill up the whole family, give this hearty casserole a try. The peas are optional, and you can definitely swap out the cracker topping if you’d prefer something else. Cook the egg noodles according to the directions on the package. Drain the noodles and set aside. Combine the soup, milk, sour cream, and ground mustard in a large bowl. Then, stir in the tuna and red peppers and/or peas. Finally, mix in the noodles. Lightly grease an 8x8-inch square baking dish with cooking spray. Then, add the noodle mixture to the dish and spread it evenly. Crumble the crackers on top of the casserole (use extra if you like more crunch). Then, take the butter and slice into smaller pieces, dabbing 6-8 pieces around the cracker topping. Bake for about 25-30 minutes, or until bubbly and browned slightly on top. If you'd like to add a garnish, sprinkle with fresh thyme.